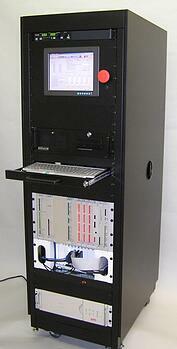 Custom designed PXI test platform based on National Instruments (NI) test platform. The platform is designed with integrated industrial PC, programmable Agilent power supplies, APC UPS, and integrated keyboard, mouse, and monitor. The platform design includes custom-designed backplane which interfaces other custom-designed PCAs to NI chassis. Custom PCAs are application-specific designs and include schematic capture, PCB layout, PIC programming, and fabrication.